Lynnfield Town Hall is located at 55 Summer Street, Lynnfield, MA 01940; phone: 781-334-9410. Photo: Hart House, ca. 1695, 172 Chestnut Street, Lynnfield, MA. Listed on the National Register of Historic Places in 1990. Photographed by User:John Phelan (own work), 2010, [cc-by-3.0 (creativecommons.org/licenses/by/3.0)], via Wikimedia Commons, accessed September, 2017. According to Lynnfield: A Brief History, the first settlement in what is now Lynnfield was 10 square miles and named "Saugus" after the Saugus Indians who lived there. Artifacts indicate that Indians lived there at least 3,000 years ago—including an Indian encampment on what is now Partridge Island. Many of the artifacts are currently housed at the Harvard University Museum in Cambridge. The name of the settlement was changed to Lynn in 1637. In 1638, the land was extended 6 miles inland to accommodate the growing number of residents. The 13 square miles were given out in land grants of between 40 and 800 acres until 1640 (settlers who advanced money for the building of the Colony received between 200 and 800 acres in return; those who had not advanced money received between 40 and 80 acres). Rules accompanying the land grants included centrally locating homesteads on the lots, which created several small villages, each of which was required to be outfitted with a church, school, military company, and town common (or "training field"). In the 17th century Lynn was primarily an agrarian community and remained such until the early 19th century. In 1646 the Town officials proclaimed that every third day of the week would be market day. 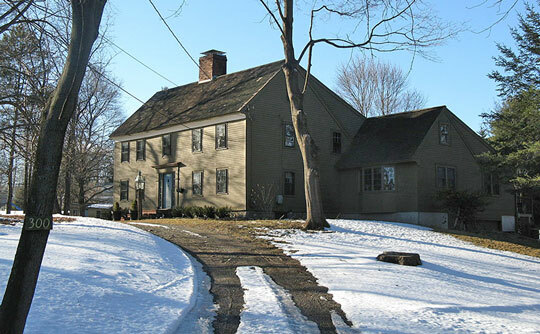 In 1712, Lynn End was established as a parish, and in 1782 it was established as the District of Lynnfield. In 1814, the District was incorporated as the Town of Lynnfield. In the early 19th century, industry in Lynnfield included shoe factories and mills, which provided work for many of the town's farmers during the winter months, as well as other residents. This was especially convenient for farmers due to the fact that much of the work was not done at the factory, but in the workers' homes. More and more residents took jobs in the factories as the Industrial Revolution evolved. In 1806, the Newbury Turnpike (Broadway in Lynnfield) was built, and hotels and inns sprung up to accommodate the through-travelers. In addition to the Turnpike, two railroad lines providing 16 trips per day increased the access to and through Lynnfield. In the 1930s and 40s, one of the primary attractions in Lynnfield was Kimball's Starlight Ballroom, an outdoor dance hall located where the Kernwood restaurant is now in South Lynnfield. The ballroom flourished with the sounds of Benny Goodman, Tommy Dorsey, Paul Whiteman, Artie Shaw, Duke Ellington, Cab Calloway, Mal Hallett, and Ina Rae Hutton until the early 40s when the war drove people's energies elsewhere. Until then, as many as 1,000 couples could dance under the stars at a time! Town of Lynnfield, MA, Master Plan, 2002, 222.town.lynnfield.ma.us, accessed September, 2017.